This relatively mature deciduous woodlot provides many opportunities for the residents living in the area to get out and enjoy nature. 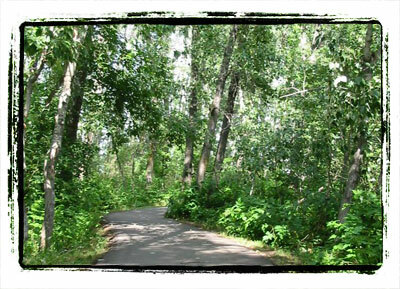 The presence of a paved trail through this remnant woodlot allows the birds, plants, and flowers to be enjoyed while cycling, rollerblading, or walking through this urban forest. The trail network also links the woodlot with a stormwater management pond to the southeast and in doing so forms a very attractive open space. Creating links such as this in an urban park system also plays an important role in minimizing the isolation of a site by providing potential corridors for the movement of some animal species. Trail system through the treestand with connections to the neighbourhood trail network. 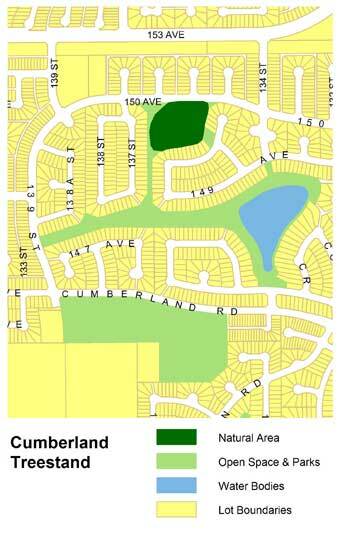 Access to the Cumberland Treestand is provided at the intersection of 135 St. and 149A Ave. There is also a trail system through the stand with connections to the Cumberland storm pond and neighbourhood park to the south and east, respectively. The Cumberland Treestand is home to a variety of bird and small mammal species as well as a variety of plants.